Herbed Flank Steak has got to go on your summer grilling must-try list! It is AHhhh-mazing!! Nichole and I are so excited to share a Herbed Flank Steak and Healthy Weekend Tips with you today for Fit Friday! Herbed Flank Steak is made with Herb Marinade for Everything! Coat your steaks with Herb Marinade for Everything, let them marinade for 3-6 hours, then cook them on the grill! Herbed Flank Steak is a great combination of lean protein and herbs that will fuel your body with amazing health benefits! For more info on the herbal health benefits, check out Herb Marinade for Everything. Fit Friday is our introduction into an awesome weekend. 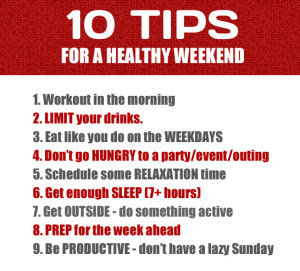 This Fit Friday I wanted to talk tips for a healthy weekend. Often Friday starts out strong, but as the day continues the weekend attitude sinks in a bit more and by Saturday the week is gone along with all resolve and goals. So let’s talk about how to keep the resolve and goals throughout the weekend. Many of these tips are the same ones that keep us going during the week. We have worked hard all week long, that doesn’t mean we get two days to go crazy and forget it all. Instead keep your goals in mind and stick with them. I know a lot of people use Sunday as a recovery day, awesome! But you still need to focus on good nutrition and sleep. If you know you have a big family dinner Sunday night be sure to eat a healthy lunch and don’t let your crazy family give you too many drinks. Don’t get me wrong, you can relax and enjoy your weekend, but don’t let two days ruin five days of solid work and focus. Herbed Flank Steak has the perfect marinade and is the perfect dish for any setting! Make your Fit Friday awesome!! Combine all ingredients in blender- excluding steak. Pulse until herbs are minced. Place flank steak in ziptop plastic baggie or container with a lid. Add herb marinade, coat meat, place in fridge for 3-6 hours. Heat on grill to medium high, cook 5-7 minutes per side or until desired doneness is achieved. Allow to rest for 5 minutes, slice and serve!